New Road Names & Paint Schemes! Introduced in 1949, the Electro-Motive 1500hp GP-7 combined the machinery of the F7 with a hood-type carbody that offered high visibility and easy engine access. The GP-7 was used in pulling every conceivable type of train and was sometimes substituted for part of a set of cab units. The GP-9 utilized a 1750hp engine and was visually similar to the GP-7. N GP-7 Locomotives - New Paint Schemes! N GP-7 Locomotives - Limited Edition! N GP-9 Locomotives - New Paint Schemes! Based on prototypes that were built during the 1960s, these cabooses were very popular on railroads from coast-to-coast. N Standard Vision Caboose - New Road Numbers! N Standard Vision Caboose - New Paint Schemes! N Extended Vision Caboose - New Road Numbers! N Extended Vision Caboose - New Paint Schemes! N 90 Ton Hoppers - New Paint Schemes! N 90 Ton Hoppers - 3-Pack! Both scales have fine features like plastic head and brake lamp covers. 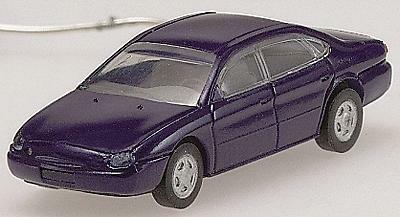 Available in actual 1996 Ford Taurus colors, these models are officially licensed by the Ford Motor Company?.